In our experience children tend to bounce back quicker from emotional experiences and big and little traumas than adults. A child’s brain is still growing and developing and therefore it is easier to change to and heal. Eye Movement Desensitization and Reprocessing Therapy is a therapy based on the idea that negative thoughts, feelings, and behaviors are the result of unprocessed memories. The treatment includes standardized procedure that requires focusing simultaneously on spontaneous association or traumatic images, thoughts, emotions, and bodily sensations and bilateral stimulation. The bilateral stimulation is the therapist’s ways of engaging the left and right parts of the brain to help the client reprocess and unstick painful experiences and traumas. This can be done with eye movements or gently taping to stimulate these parts of the brain. It is the same mechanism that allows us to process through memories and experiences in REM (Rapid Eye Movement) sleep. It is widely assumed that severe emotional pain requires a long time to heal. EMDR Therapy shows that the mind can in fact heal from psychological trauma much as the body recovers from physical trauma. When you cut your hand, your body works to close the wound. If a foreign object or repeated injury irritates the wound, it festers and causes pain. Once the block is removed, healing resumes. The brain’s information processing system naturally moves toward mental health. If the system is blocked or imbalanced by the impact of a disturbing event, the emotional wound festers and can causes intense suffering. The great part about EMDR Therapy is that its goal is to reduce the distress without the need for a detailed description of the event, extended exposure, or homework. EMDR Therapy enables people to heal from the symptoms and emotional distress that are the result of disturbing life experiences. EMDR Therapy has a broad base of published case reports and controlled research that supports it as a validated treatment of trauma and other adverse life experiences. The Department of Defense and The Department of Veterans Affairs Practice Guidelines have placed EMDR in the highest category, recommended for all trauma populations at all times. 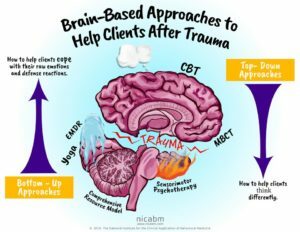 Most recently, the World Health Organization (2013) has stated that trauma-focused CBT and EMDR are the only psychotherapies recommended for children, adolescents, and adults with PTSD. How can this help me? EMDR Therapy can help with a wide variety of symptoms including anxiety, worry, fearfulness, and sadness. It can also help adults face the negative beliefs about themselves that are built on experiences throughout their life. EMDR can help adults who want to be the best version of themselves and can experience Performance Enhancement in different areas of their life. With our experience with EMDR Therapy, we have found that EMDR Therapy is a useful approach with younger, less verbal children. It can be administered therapeutically and can also seem like a game that is played between therapist and child. When children are having fun, they are probably more open to being in a therapist’s office.